You might think with Avengers: Infinity War's $640M opening weekend it would put the incredible three-month long run of Black Panther to an end. But that's not the case, in fact the film had the strongest hold of any movie in the top 10 and continues to earn big bucks, and that's with the home release now only a week away. 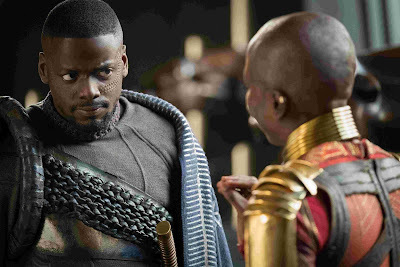 With the Blu-Ray and digital availability so close we're now getting a look at the first deleted scene, featuring on a key moment between lovers Okoye (Danai Gurira) and W'Kabi (Daniel Kaluuya). I really wish Ryan Coogler had found a way to keep this scene in, but he explains in the intro that it just didn't fit. First of all, it takes place moments after T'Challa's death at the hands of Killmonger as Wakanda faces a brutal new regime dedicated to global conflict. It also deepens our understanding of the relationship between Okoye and W'Kabi in that they are actually married, not just "dating" or whatever it is Wakandans do. She's understandably angry with her husband for betraying T'Challa and helping Killmonger gain entry to the Tribal Council. But the most stinging jab comes when she accuses W'Kabi of actually wanting T'Challa to lose and die in the fight, a charge he does not deny. Black Panther is still in theaters now, but hits digital on May 8th and Blu-ray a week later.